WizKids will release a Dungeons & Dragons Waterdeep: Dungeon of the Mad Mage Adventure System Board Game in both standard and premium editions in March. 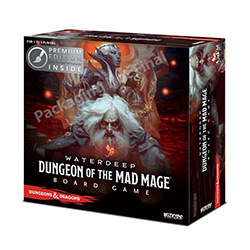 Based on the Wizards of the Coast�s Dungeons & Dragons Waterdeep: Dungeon of the Mad Mage adventure book where players enter the dungeon Undermountain and the subterranean refuge of Skullport, to take on the mad Wizard Halaster Blackcoak (see �WotC Reveals Two New 'D&D Waterdeep' Volumes�). In the board game, adventurers explore and search for treasure while navigating traps and dealing with monsters. The game includes multiple scenarios, quest, and game play deigned for a single player or a cooperative group of 2 � 5 players. There are new environment cards that get replaced when a new environment card is drawn, and new bane/boon cards, some of which have an effect that will require a new draw of the cards, to resolve the bane/boon effect. The box includes 42 single-colored* miniatures, 5 hero tiles, 4 villain tiles, 20-sided die, 40 interlocking dungeon tiles, 5 double-sized interlocking special tiles, 225 cards, over 300 tokens, an adventure book, and a rulebook. The game is for 1 � 5 players, ages 14 and up, and plays in 1+ hour. * There is both a Standard edition, and a Premium edition. The Premium edition includes the fully-painted miniatures option, while the Standard has a single-color miniature option. Standard MSRP is $79.99. The Premium edition has an MSRP of $159.99. This board game can be combined with other D&D Adventure System Board Games in the series, including Tomb of Annihilation, Temple of Elemental Evil, The Legend of Drizzt, Castle Ravenloft, and Wrath of Ashardalon.